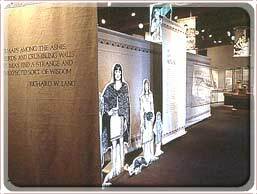 The Anasazi Heritage Center is a museum that interprets the amazing history and diverse culture of the Four Corners region. The center offers films, hands-on discovery area and permanent exhibits which all explore archaeology, local history and Pueblo, Ute and Navajo life ways. From the Center is a paved trail that gives guests access to the Escalante and Dominguez Ruins. The Center offers many special exhibits along with lectures, demonstrations and special events. 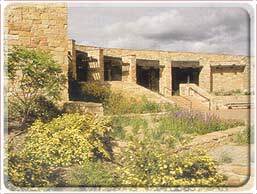 The Anasazi Heritage Center is home to over two million artifacts from southwest Colorado. The Anasazi Heritage Center offers a wide variety of activities. Take the 1/2 mile nature trail to Excalante Pueblo and get a breath taking view of Mesa Verde, McPhee Reservoir, Four Corners and more. Grind corn, weave on a loom, use microscoptes and touch real artifacts. View amazing pithouse replicas, films and exhibits. The Center also has a unique archaeology computer program allowing guest to become an archaeologist. The Anasazi Heritage Center is located right outside Dolores Colorado and only 17 miles from Mesa Verde.